When planning a vacation, many people like to choose a destination that has a lot of beautiful beaches. Visiting cities and historic locations or family attractions can be a lot of fun, but there’s nowhere quite as relaxing as a beach, and this is why many tropical islands and areas like the Caribbean are seen as such popular and paradisiacal holiday destinations. Gorgeous beaches and warm weather make the perfect combination, allowing holiday-makers to enjoy all kinds of fun in the sun, from swimming and sunbathing to snorkeling and scuba diving. All of these activities and so much more can be enjoyed on the island of Jamaica. This Caribbean country is well-known for its exceptionally friendly people, delicious local cuisine, lush jungles, and breathtaking beaches, and one of the top resort towns in Jamaica is Negril. Negril is only a relatively short drive away from Jamaica's main international airport and offers an authentic slice of Jamaican life to every visitor, with a lot of untouched wilderness and pristine shoreline to explore. 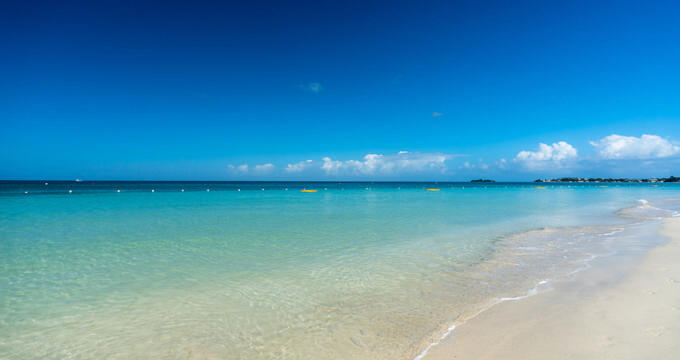 Some of the beaches at Negril have been ranked in Top 10 beach lists by global travel experts, so if you’re a beach-lover in Jamaica, you simply can’t miss out on a trip to this town. Whether you're looking to do some swimming, sunbathing, diving, or just relaxing in a sun lounger or hammock with a cool cocktail by your side, Negril is a real Caribbean haven and we’ve amassed some useful information and key overviews on the very best beaches around this little corner of Jamaica. This is the most famous beach in Negril and the number one stop for most tourists in the area. It's also a very popular location with the locals and as the name suggests, this beach runs from one mile after another, so there's way more than enough space to cater to large crowds. Even on the busiest of days, you can just keep on walking along this Negril beach and find a perfect private spot to sit with your family or friends. The sands here are soft and sugary, while the waters are a beautiful sky blue with soft, frothy waves lapping at the shore. It's a great spot to wade out into the warm Caribbean Sea before heading back to the beach and soaking up the sun's rays with a fresh juicy cocktail or some fried seafood snacks to fill you up and give your energy levels a big boost. Since Seven Mile Beach is simply so huge, the conditions and amenities can vary at different points along it, so we’ll also be highlighting a couple of key stops on the way for you to make the most of your Negril beach trip. The beach is lined with resorts, hotels, eateries, bars, and more, and there are a lot of lovely stops along the seven mile journey from one end of the beach to the other. A highly popular spot on the Seven Mile Beach strip is Bourbon Beach. This Negril beach location is a prime area for parties and live entertainment. It's not uncommon to see bands and musicians playing here each evening, offering bit of local flair and fun as the sun goes down. The local resort restaurant, meanwhile, serves up some very tasty treats and a wide range of drinks for all to enjoy. You don't have to pay any admission fees at this Negril beach hotspot and it's a super place to go late in the day to enjoy some dancing and authentic Jamaican culture. Up at the northern edge of the Seven Mile Beach, Bloody Bay Beach was allegedly named in honor of a particularly gruesome Caribbean pirate clash that occurred in the area many years ago. Fortunately, there's no trace of any violence at this Negril beach nowadays. Instead, nothing but soft, powdery sand and calm waters are waiting to greet you. The nearby coral reef is a nice spot to do some diving and helps to protect the shoreline from rough waves, making it a nice spot for families with young children to do some swimming. This is a rocky beach spot found near the southern end of the Seven Mile Beach and serving guests of the local Grand Palladium Jamaica Resort. It's an adults-only beach offering some stunning views of the Caribbean Sea, especially late in the day when the sun starts to set. Many people gather near this part of the beach in the late afternoons to watch the sky light up in a whole host of reds, oranges, yellows, and golds, and there are lots of loungers and umbrellas to provide a lot of comfort. The fact that this beach is exclusively for adults also gives it a very quiet and calm atmosphere, a perfect spot for folks who just want to listen to the waves and chat with their friends without any worries. This is a little picturesque island just a short ways off the Negril coast, and it's definitely worth a trip for any Negril tourists looking for some fun in the sun away from the Seven Mile Beach. The beach was named after a bird of the same name that migrates there each year to nest. Of course, the only way to get to the island is by boat, but there are various low-priced services that will take you over and pick you up later on. The great thing about Booby Cay is that the island is situated right by a stunning reef, home to all kinds of tropical fish and colorful marine life. It's a super spot to do some snorkeling, and there are lots of fresh food and drink servers on hand too, offering up some local delicacies to ensure you'll never go hungry or thirsty.